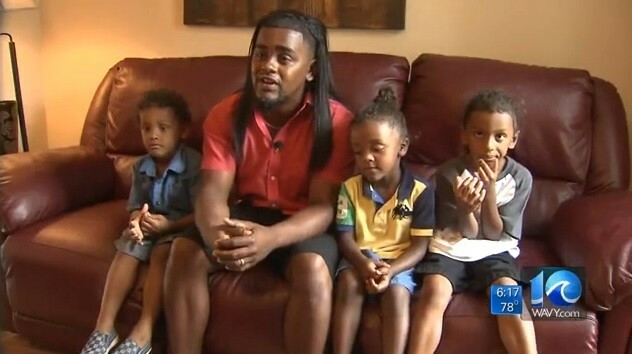 A man in Virginia that was charged for firing a gun at police who were attempting to enter his house in the middle of the night, unannounced, has finally been exonerated in a jury trail. Not only did police not announce themselves, but they were also at the wrong address. Last January, Brandon Watson, of Portsmouth Virginia heard his back door rattling, and saw shadowy figures dressed in black in his back yard. He grabbed his legally owned firearm and went to go see what was going on. When Watson approached his back door he announced himself and yelled that he was armed. Just then, two laser beams drifted across the room and stopped on his chest, at which point he fired a warning shot in response. Brandon explained to a local reporter, “We ran upstairs very quickly … she saw guys in all black from right here in this window looking down. I announced myself, ‘Who is that? Who is that? I have a gun.’ And as soon as I said that, two red laser beams were on my chest, so I looked at the red laser beams on my chest, and I fired a warning shot,” Watson said. After firing a single shot through the window, Watson ran across the street to get help from a neighbor. When he returned to his house he was surrounded by police and they ordered him to drop his weapon, which he immediately did. “They said, ‘we just got news you shot at an officer.’ I said, ‘An officer? Nobody came to my door. What do you mean an officer? I didn’t know there were any officers in my backyard,’” he told WAVY.com. Following the intrusion, Watson was arrested and charged with reckless use of a firearm. In the year and a half since the incident, there have been a number of court cases, the first of which Watson was found guilty by a judge. After appealing his case, Watson finally got a his trial in front of a jury, who threw his charge out after deliberating for less than an hour. The jury caught the officers in multiple lies throughout the course of the trial, and were struck by the fact that this whole thing could have been prevented had the officers been competent enough to respond to the correct house. The fact that this jury was so skeptical of the police and felt sympathy for Watson’s situation, is a positive indication that the hearts and minds of the average people are starting to understand the dangers of the growing police state.